If your asking the difference between these two, then you're asking the right question. It's 3D compatibility – that's it. And of course that lowers the price some and makes this very compelling value-oriented LED-LCD even more attractive if you don't care anything about 3D programming. The 60LN6100 does not have the Cinema Screen design of top tier models and also has the Magic Remote as optional rather than included. But other than that it offers fantastic value and quality. The native 120Hz panel provides some extra protection against blur and judder when viewing sports and side to side slow panning. It's a nice feature to have in your pocket and the LN6100 does a good job of eliminating the blur and an OK job with the judder. Judder from images moving side to side (especially from movies) is one of the problematic aspects that are difficult to overcome. We are relieved though, that the LN6100 does not overcompensate in it's judder elimination and create kitschy fake-looking background effects like the 2011 models did. 3D is omitted in the 60LN6100. Many people that do not care about 3D programming and will enjoy the price savings without it. The Magic Remote is awesome and I would recommend it if you purchase this TV. It makes browsing and Smart TV sifting faster and easier. It works well, and this is its 3rd generation so LG has had plenty of time to perfect it even though we liked the first two versions just fine. This version also comes with a voice command feature so that you can control the TV by voice for some simple functions. LG's Smart TV Apps as well as 3D World included with the LN6100 series. The Smart TV suite is included with the 60LN6100 and premium Apps include: Netflix, Hulu Plus, YouTube, MLB.tv, Facebook and Twitter. It's overall a very complete solution – especially in the premium area. The free Apps are pretty weak and do not provide a lot of value. Testing many of the premium Apps such as You Tube and Pandora and NBA Game Time proved a positive experience while the free Apps section was the opposite. There is a newly enhanced SmartShare feature which offers owners the ability to use the Smart Phones or Tablets with the LG Smart TV. Connectivity options include WiDi and Miracast. We found the search and retrieve function on LGs TVs last year a little slow, and thankfully in response to that they have increased CPU speeds by 120%. This still is not as fast as those TV manufacturers that host their Smart TV content in the cloud but it's an improvement. The graphics processing unit has also been speeded up to 300 percent faster. One of the big questions we had about the 60LN6100 series was whether or not the TV had built in Wifi and a built in Web Browser. These two features do not often reach this far down in the manufacturers TV lineup. The LN6100 does indeed include both of these options along with its Smart TV suite. 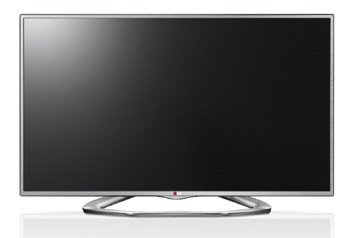 The 60LN6100 is LGs answer to battling some of the more competitive 60 inch TV models on the market today. Since it avoids the most expensive features such as 3D, Cinema Screen, and inclusion of the Magic Remote it can offer a great value and price. The picture quality is very good as is sound quality and you have the option of playing with LGs most recent Internet TV options.